Europe continues to disintegrate politically. On the 26th of February the Irish people went to the polls in a general election. Nearly 3 weeks later a government has not been formed due to the fact that no main party won an outright majority. It looks like this instability will remain for at least another month or so. Spain went to the polls 3 months ago and still no government has been voted in. Belgium was unable for 541 days to form a government, following its general election in 2010. “By applying a common interest rate where diverse rates are required, the Euro alternately stokes national inflation and deflation in. This puts huge strain on the political systems of those countries affected. So we have seen political revolts in Greece, Spain, Italy and Portugal, where parties that have dominated national politics for decades have been serially humiliated. Popular disillusionment with the EU economic policies is more likely to lead to the disintegration of the single currency than towards fiscal union, the goal beyond monetary union. the long-term benefits far outweigh the short-term costs. In my opinion as long as European leaders maintain a denial mentality regarding the Euro, Europe will continue to sleep-walk into economic catastrophe. As long as the real issue behind economic stagnation is ignored the greater will be the divergence between the world of the bureaucrats and reality of main street. Failure to form governments is a manifestation that this de-coupling is growing in complexity and seriousness. History has shown that systemic political failure is the mother of social dysfunction, revolution and eventually civil war. The last thing the world needs now is a return to the failure of past European experience. We must hope that courageous leadership develops in Brussels which ends the spell of current mental sophistry. What is needed is a detailed formula, an agreed plan, a consensus if you will, to formally allow members of the failed Eurogroup to revert back to national currencies in an orderly manner. If it is left too late circumstance will dictate events and instead of management and control; strife, stress and social dislocation will be the order of the day, and we all know where that may lead. The Bear counter, rally which commenced on the 11th. and 12th. of February, continues as we speak though all eyes as usual are on the FED. 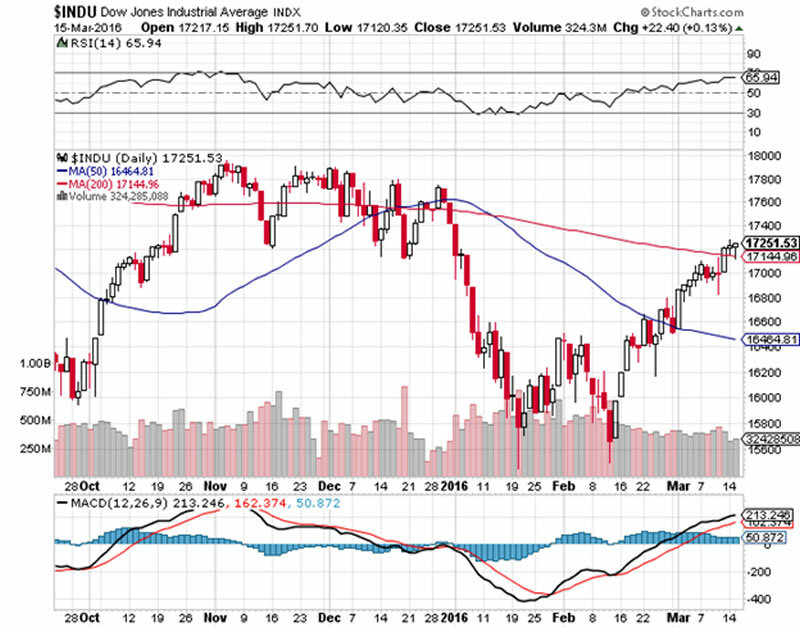 Both the Dow Industrials and the S & P 500 are on the cusp of breaking through their 200 DMA, with the NASDAQ not too far behind. So far so good. 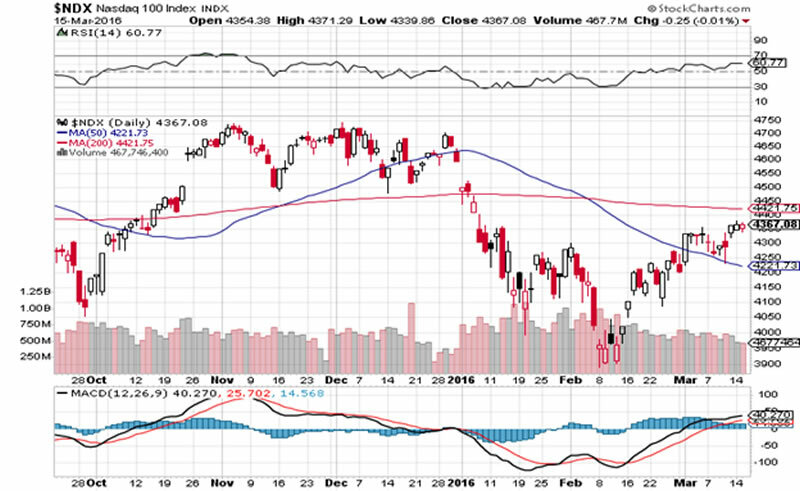 Should Janet Yellen keep interest rates on hold it is conceivable that markets will reach December highs. However, I would advise caution. The counter rally is beginning to lose steam. 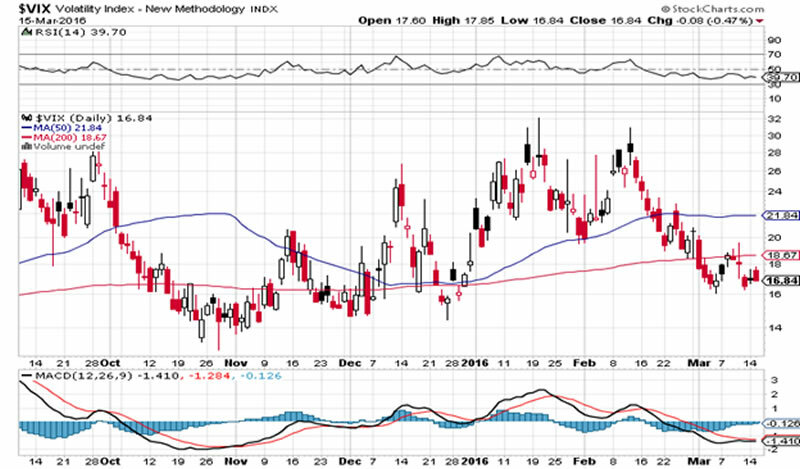 The VIX is back down to the lower levels of its trading range which indicates that a pullback can occur at any time. In a bear configuration such contractions can get ugly very quickly, wiping away short-term gains. Hard sell stops are advised.